Turda Gorges is a natural reservation since 1938 and it’s located at 33.9 kilometers from Cluj-Napoca, a distance that can be traveled by car in less than 40 minutes. Turda Gorges is included on UNESCO list, among the most important natural monument in the world. Here, archaeologists found remains of mammals of the Copper Age, Bronze Age and Iron Age. 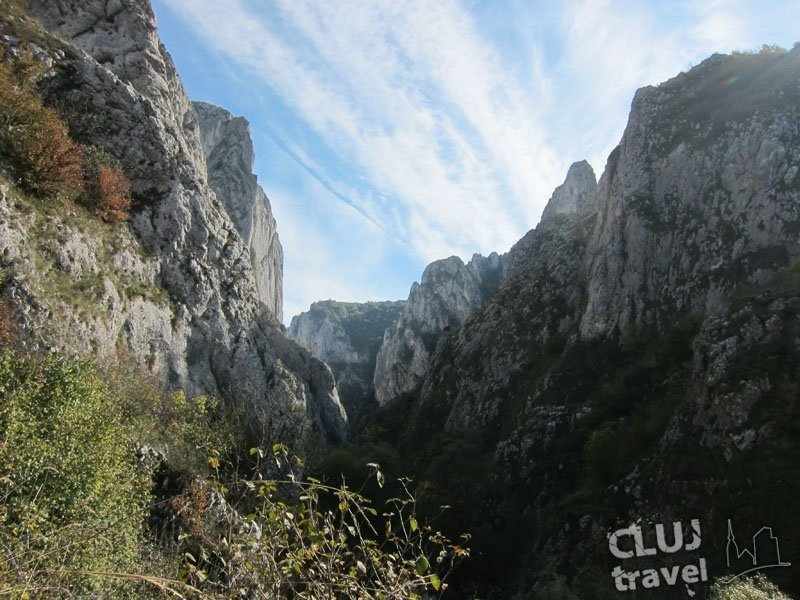 For the nature enthusiasts who visit Cluj, the route Cluj – Turda Gorges can be a very nice way to spend a full day in the middle of beautiful nature scenery. From the city, the route follows the road DN60 to Turda. From here, it goes on DN1 (E81) immediately after leaving Turda towards Alba-Iulia. The route crosses the villages called Mihai Viteazu and Cheia, from where a paved road leads to the destination. Turda Gorges is about 1270 m long and occurred as a result of eroding of river Hasdat in Jurassic limestone rock. The maximum height reached by the rocks is 250 m, offering tourists spectacular scenery. Turda Gorges is located in North of Trascau Mountains, which are in the East side of Apuseni Mountains. This is just one of the other gorges of Trascau Mountains. Turda Gorges’ points of interest are a number of almost 60 caves in the area, from which the longest one measures 120 m. These caves we used in the past as hiding places from the Tatar invasions. The most important caves are Bats Cave, Oven Cave, Calastur Cave, Big Castle Cave and Hill’s Cave. Turda Gorges’ landscape consists of high and steep cliffs, rocky dales, sharp ridges, stone towers, arches etc. Flora and fauna of Cheile Turzii comprise over 1.000 species of plants and animals, some of them endangered. These include wild garlic, eagle rock, rock butterfly and many more. The landscape is completed by Turda Gorges Cottage, located at 1385 m altitude. Built in 1935, the building has a medieval look that’s very attractive for tourists looking to feel closer to nature and history in this special area. Turda Gorges, due to its beauty, can be included on the long list of Transylvania’s attractions that can be visited departing from Cluj-Napoca. Around this area, tourists can also choose to visit Turda Salt Mine, Potaissa Roman Camp or Felix Baths.